THE RESULT WILL BE DECLARED SHORTLY PLEASE CHECK THE RESULT ACCORDING TO YOUR SEMESTER. 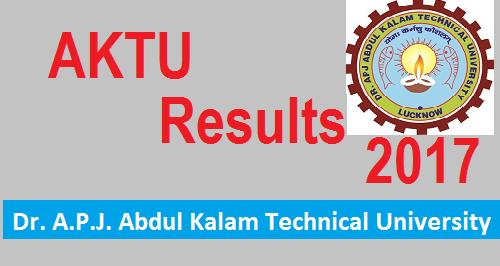 AKTU Odd Semester Result 2016 is likely to be declare on Monday. Controller of Examinations Prof. JP Pandey said that the results are ready. Result will be issued as Soon as Moderation policy are determined.University is all set to release the result by Monday. Dr. A.P.J Abdul Kalam University (AKTU) is going to provide great relief to near about 80K students of the University who sit for the December 2016 Odd Semester Examination.This is for the very first time the University is going to implement special Moderation Policy. The implementation of this policy will surely bring down the number of students who fail. For this University has formed a committee under the supervision of University Controller of Examinations Prof. JP Pandey, on Thursday. Release of result is likely to be start with the declaration of 1st year Odd Semester Result of session 2016-17. The University Controller of Examinations Prof. Thursday. JP Pandey supervision of a committee has been formed. Vice Chancellor Prof. Vinay Kumar Pathak said that in the examination some paper are often very difficult. Even for the students it become really difficult to pass the examination. And on the other hand several papers are so easy that it become easier for the student to grab good amount of marks, hence it is very important to maintain the level of Examination papers so that proper and right evaluation can be performed. Prof. Pathak said IIT and NIIT have used such policies. According to him, by the introduction of this policy a true evaluation of students can be performed and it can also reduce the number of students who fail. After the Maths Examination held in last December 2016, many Complaints were filed by the students. According to the Students the Exam was too hard for the students and their were many questions out of the syllabus. According to University Students will be surely benefited for the new Moderation Policy in such cases.